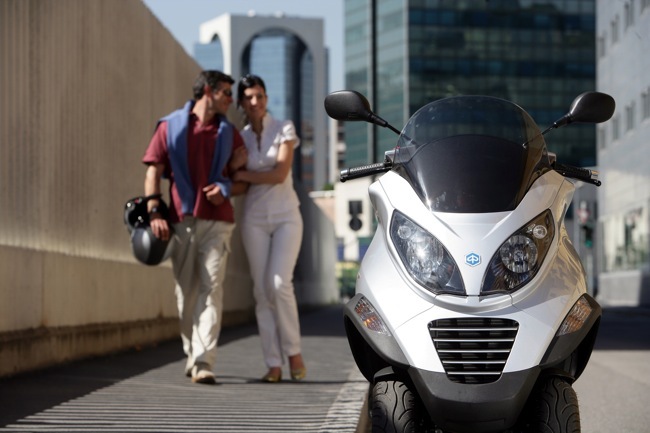 Ride away free on Kymco this Summer. Take your choice of either the classic Espresso 150 or the sporty Quannon 125. To celebrate the arrival of summer, Kymco is offering the chance for customers to ride away for FREE on a Kymco Espresso 150 scooter or Kymco Quannon 125 motorcycle from participating Kymco dealers. Until the 31st December, 2009, customers will pay the RRP only on the Espresso 150 and Quannon 125 with no on-road charges – a saving of up to $800. This means an Espresso 150 will cost only $3,990 and the Quannon 125 only $4,490 – ride away with no more to pay. The Kymco Espresso 150 is an icon of the Australian scooter market and is widely acclaimed for its unique European styling and big 16 inch alloy wheels. The single cylinder, 4 stroke, 150cc engine has all the power to take you around town in comfort and safety, while the twin rear shocks with adjustable pre-load, a front disc brake and electric and kick start are further evidence of the legendary Kymco engineering. However, the devil is often in the detail, and there’s incredible attention to detail on the Espresso. Main and side stands, a pillion grab bar, retractable pillion foot pegs, locking under seat storage, a shopping bag hook, locking front glove box, a digital clock and two-way adjustable mirrors cap off an impressive package from Kymco. Most notably, though, the 16 inch alloy wheels provide extra stability and safety and minimize the dangers of obstacles such as pot holes or cobble stones. Recently released to the Australia motorcycle market, the Quannon 125 has been a roaring success with its unique combination of style and performance. The fully-faired Quannon boasts a single cylinder, 4-stroke 125cc engine, while the electric starting gets riders going instantly with plenty of power for riding around town. 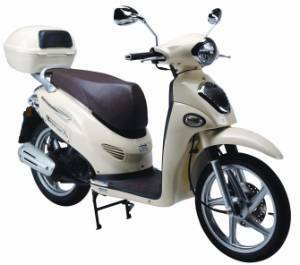 For genuine sports appeal in a smaller bike, nothing beats the big ‘sports bike’ look of the Quannon 125. 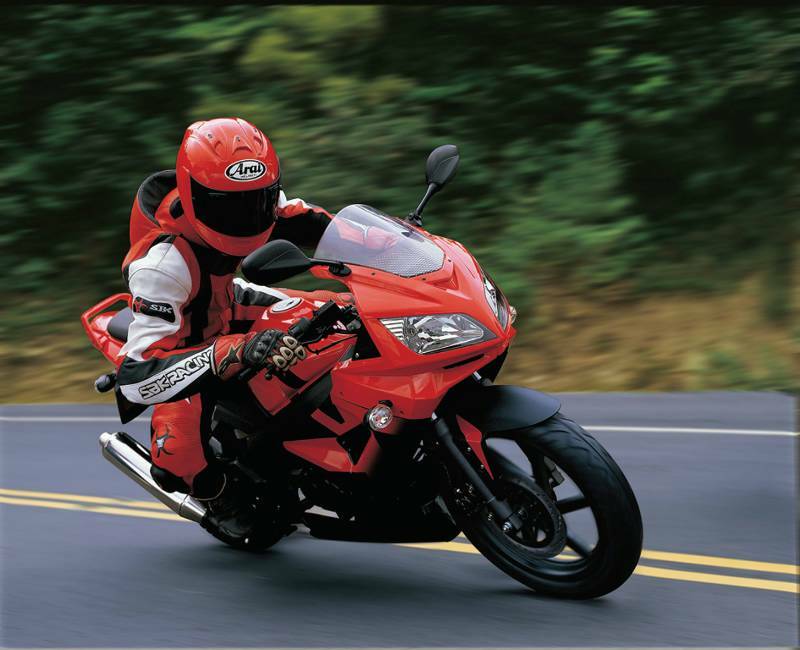 The full fairing aerodynamic design adds to the performance its powerful 4-stroke engine puts out. With wide tyres on 17” wheels, the Quannon 125 boast amazing grip and agile and responsive steering. Disc brakes on the front and rear, digital instrumentation and twin halogen headlights cap off this impressive package. This special offer on the Kymco Espresso 150 scooter and Quannon 125 motorcycle ends on 31st December, 2009. With more to come click on the links to see a load of different scooters from the major brands at this years eicma 2009 show in Milan. A summary of all that happened in scooters at Eicma 09. 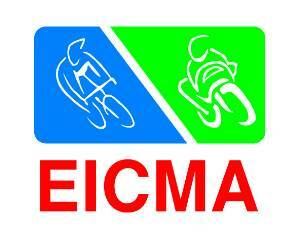 The largest powered two wheeled show in the universe. 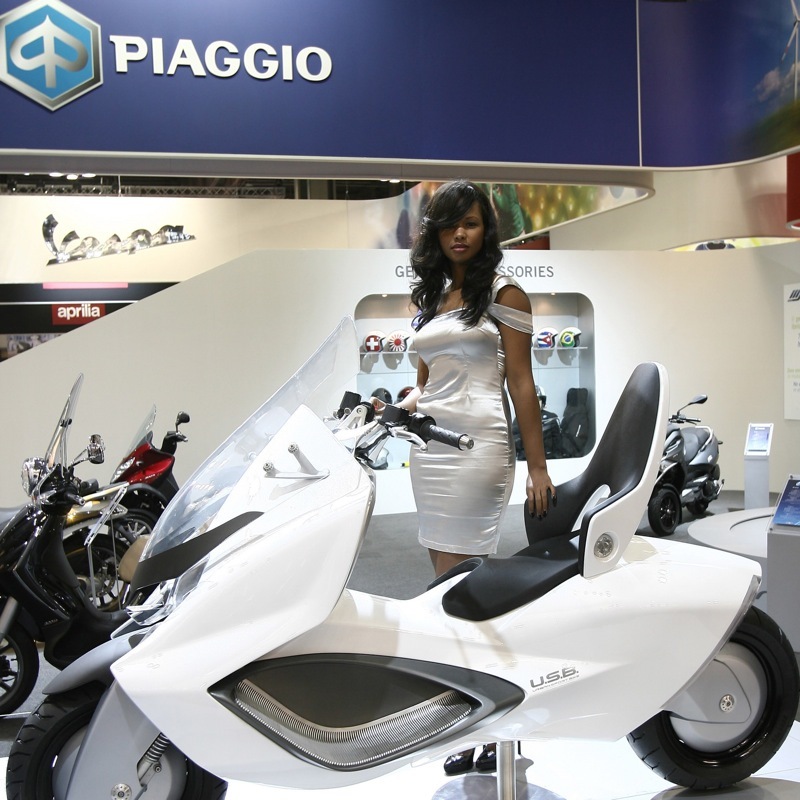 Here were just some of the brands on display at Eicma 2009 in Milan, Italy. As media becomes available experience first hand what's new on two wheels in the scootering world. If the model in the list remains unlinked then this means we have media to publish soon, so keep checking back. Snapshot of the Kymco display at the Sydney Motorcycle show. 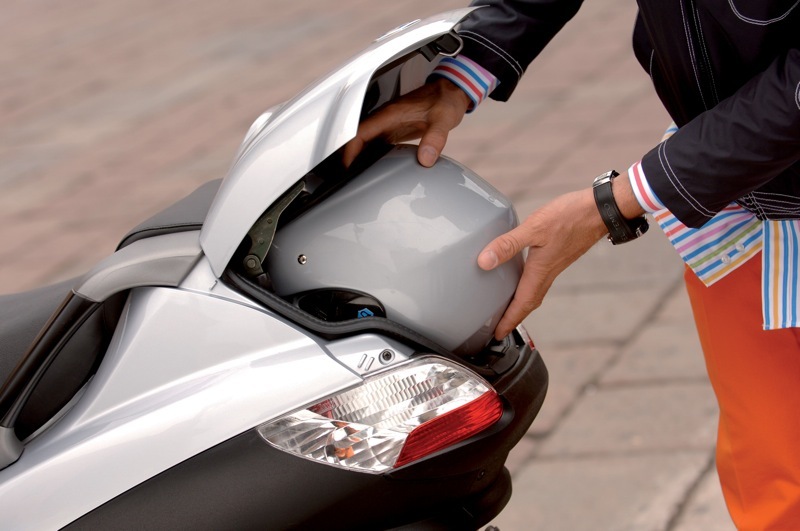 We also chat with Alan Collins of Kymco Australia to find out what's new and happening. Scooter riders in Victoria have backed VACC’s call for scooter safe routes. Scooter riders turned out in force to participate in the recent 4th annual VACC ‘Safe Routes’ Scooter Rally, from Luna Park to Lygon Street. As well as a chance for scooterists and club members to socialise as riders, the Rally has become a rallying call to politicians. “Scooters are cheap, economical, environmentally friendly and easy to park. They ease congestion and are a practical alternative mode of transport. Yet, riders are made to feel like second class citizens,” VACC Executive Director, David Purchase, said. “In Victoria, scooterists and motorcyclists pay an additional Motorcycle Safety Levy of $60.50, on top of normal road charges. They attend rider training courses; are licensed road users and their scooters are registered. Most are also experienced road users who drive other vehicles. “However, policy makers continue to overlook scooters and transport planners do not make adequate provision for them. “Riders at VACC’s ‘Safe Routes’ Scooter Rally signed a petition calling for the implementation of designated and signed ‘Safe Routes’; access by low-powered scooters to use designated bicycle, transit and bus lanes; filtering in stationary or slow moving traffic; allowing boxed turns at certain busy intersections; six monthly registration; dedicated scooter training courses and a separate licence for scooter riders. “Plans are already underway for next year’s VACC ‘Safe Routes’ Scooter Rally. And while no doubt it will be another fun and eye-catching occasion, the question to be asked is what, if anything, will have changed for scooter riders in the next twelve months. “Sadly, we expect the answer will be ‘not much’ because Government seems reluctant to take scooter riders seriously. But that will not stop VACC from continuing to lobby for better awareness and greater protection for scooterists,” Mr Purchase said. Don't forget the Sydney Motorcycle and Scooter Show starts this Friday at Homebush. Along with the below new motorcycle model releases, get down to Homebush to see displays from Vespa, Piaggio, Kymco, Honda and Yamaha to name a few. Just days remain until the doors to the 2009 Sydney Motorcycle Show open and organisers are confident of delivering a value-packed, variety-driven event to two-wheel enthusiasts of all ages and levels of experience. Over 110 exhibitors will fill the dome and halls of Sydney Showgrounds from Friday November 20 to Sunday November 22, showcasing the best there is to offer in new motorcycle models and accessories, apparel, safety gear and services. The presence of all major motorcycle manufacturers and distributors will ensure choice without compromise for experienced or first-time riders. Event Manager Mark Petersen expected the diversity of manufacturers and models to attract large crowds over three days. “The Sydney Motorcycle Show draws riders from all backgrounds to browse and compare over 600 new bikes from all sectors of the market,” said Petersen. “Our exhibitors have responded in enthusiastic fashion to create what we believe will be the biggest, most informative and most entertaining show to date. Much of show-goers’ attention will be focused on the models that will dominate dirt and rule roads in 2010. Harley-Davidson will introduce an update to its popular XR1200X while also adding the all-new Iron 883 to the versatile Sportster range. Accessorised versions of models from its XL, Dyna, Softail and Touring categories round out a comphrensive exhibit. Throwing down the challenge to Harley-Davidson is Victory Motorcycles, making its first-ever appearance at the Sydney Motorcycle Show. Dubbed ‘The New American Motorcycle’, the brand brings a number of full-sized cruisers and tourers to the fore. All-new additions to its V-twin touring range are the Victory Cross Roads and Victory Cross Country, powered by the 1731cc ‘Freedom’ engine and featuring unique custom styling. Visitors to the BMW Motorrad exhibit will get an up-close look at the highly-anticipated BMW S 1000 RR ahead of its Australian showroom release, slated for early 2010. The Supersport warrior features an all-new, race-bred 999cc water-cooled, DOHC, sixteen valve, inline four-cylinder power unit, plus ABS brakes and race-style Quickshift as standard. The manufacturer’s highly-acclaimed F Series will see a new addition, the BMW F 800 R.
The sporty naked bike delivers what its dynamic exterior promises – lightning sprint power and precise rider handling without compromising comfort. Yamaha started from scratch on its revolutionary new YZ450F motocrosser, introducing a range of new features as a result of its success and extensive testing on the racetrack. Fuel-injection and a new Bilateral Beam aluminium frame top the list of improvements and it is sure to be a big favourite with showgoers. Other exhibit highlights will include the new YZF-R125 and Dakar-inspired ‘go anywhere’ XTZ660 Ténéré. Kawasaki updates it successful motocross range with the exciting new KX450F and KX250F models receiving a range of engine and chassis enhancements. For the young and young at heart come the KLX110 and KLX110L, all new for the new year. Torque, horsepower are increased and control is improved through new spring and damping rates. Superior strength meets class-leading lightness in Husqvarna’s new TE250, which will be a strong competitor in the enduro range with its fuel-injected four-stroke engine. Triumph will introduce the baddest version yet of its 2.3 litre Rocket III, the Rocket III Roadster. The Roadster moves out of cruiser territory and transcends into that of the ultimate muscle streetfighter, bringing with it the biggest torque figures found on any production motorcycle, powered by an uprated version of Triumph’s iconic three-cylinder 2,294cc powerplant. Suzuki will introduce significant upgrades to its RM-Z250, hot on the heels of a dominant championship win in the domestic Supercross championship. Developed in competition, the bike receives engine, chassis and suspension developments in addition to Suzuki’s fuel injection technology, a first for a production 250cc motocrosser. Suspension, brake and bodywork developments compliment a re-designed engine and chassis aboard the new lighter and more compact Suzuki GSX-R1000. Raked-out chopper styling makes Honda’s VT1300 a clear standout. A high-mount steering head, slim fuel tank, ultra-low seat, fat rear tyre and stretched wheelbase help to create a milestone machine that all riders are sure to appreciate. These models represent a fraction of the floor space and enthusiasts will delight in experiencing more than 600 new models from these and other manufacturers, with expert advice readily available. Long termer. That’s the realm of the big boys- the car magazines that get to thrash Barinas and Falcons for extended periods, and never before has it been a term thrown around the ScooterSales office. Until now that is. Of course, I do have to address the small issue of telling the supplier I’ll be using his scoot long term- something we haven’t exactly discussed yet. But if he wants it back, he’s going to have a job on his hands. But why this fondness? Why am I smitten with the MP3 400 when I have regular access to some of the most desirable scooters? Where’s the magic come from, especially when it wasn’t love at first sight- I mean the only reason people look at it is because it has a third wheel up front, not because it’s Sophia Loren on wheels. But it’s ‘me’, it fits me perfectly and I feel at home straight away. For me, getting on the MP3 400 is like slipping into a plainly coloured tailored suit- a little bit exclusive and a refreshing and surprising difference when funky, cheap, mass-produced pinstripes have been the norm for so long. There is a sense that this scooter was made just for me; stealing my heart and mind, which has really surprised me for a couple reasons. Firstly, these long wheelbase cruiser style scooters have not been a big seller in Australia. Our environment suits these bigger scoots well, with their compliant road manners and greater rider/pillion comfort, but they just haven’t taken off. I myself am a Vespa tragic, a scooter format a long way removed from these cruising Piaggios that share the same wheelbase and back end as the Xevo 400. I recently heaped praise on the Fuoco 500, but letting it go at the end of the test period was like any other scooter. I felt the Fuoco was simply one of those big scoots that Australian’s just haven’t adopted. I loved it -especially the unwavering grip, but when it was gone, I thought nothing of it. But this MP3 400 is different- it doesn’t feel big like the Fuoco or any other big highway cruiser. I really don’t know how they achieve that, given it is the same wheelbase and weight as the Fuoco, but it really is a different machine, more what I’m used to. And with the three wheeled format from the Fuoco, the grip is just immense. Wet or dry, the MP3 400 instils a sense of confidence that no other scooter can match, and once you’ve become accustomed to how the front end functions, you’ll agree that two wheeled machines just don’t compare any more. Roll up to a set of traffic lights and flick the locking switch, it all locks into place so putting your feet down has become a thing of the past. First twist on the throttle and it unlocks automatically. This makes the centre stand redundant for everything bar servicing the rear end of the scoot, or very long term parking (months). 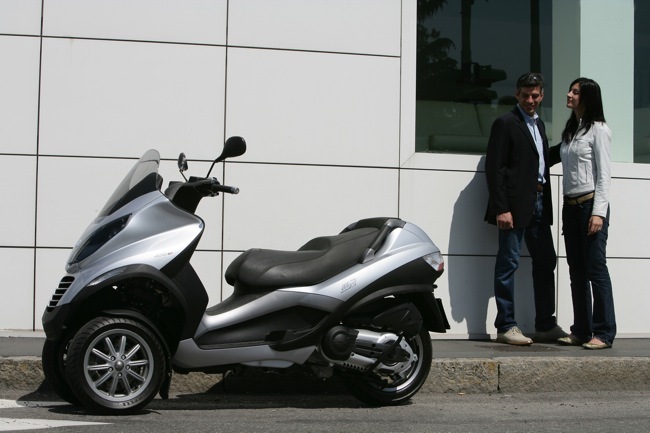 The MP3 chassis is a masterpiece, and a monumental shift in design that has revolutionised the scooter market, and at the risk of taking something away from the very first Vespa design, the MP3 is probably as big a leap in scooter evolution as the very first Vespa, creating a whole new direction. And then there’s the storage. Like most Aussies, I’m used to scoots that will accept a helmet and that’s about it. Normally I expect to see a scooter with a topbox to boost the storage capacity, but again, this is because I have not normally seen the value in these longer wheelbase machines which don’t require the Givi perched on the back. My line of work will often see me carrying a tripod and camera bag, or even a couple of tripods- which can be a juggling act on many scoots. An act I learned to live with because I thought it was normal, but an act none the less. With the MP3 however, a neat boot flap opens at the rear allowing longer items to be stowed with ease. The underseat storage swallows my two tripods and camera bag with room to spare, all via this nifty rear end. I first encountered this system on the Xevo range- it impressed me then, and it continues to impress me now. And then there’s the feel of the package. Normally, I’d say it’s the weight that makes it more manageable, but again, the MP3 is the same weight as the Fuoco. So this sense of easy and dynamic handling (which seems better than the Fuoco) must be as a result of a lower centre of gravity. A perfect combination of engine size and scooter packaging that makes highway work smooth, effortless and compliant, and city work safe, easy and dynamic. The MP3 really is two scooters in one and really shines in the city environment. The two wheels on the front make light work of any obstacle and kerb hopping, wet manhole covers and potholes really can’t unsettle this thing. This really does translate to safer riding, and two-up the sure-footedness is both inspiring and reassuring. But out of the hustle and bustle of the urban landscape, the MP3 takes on a different demeanour. It behaves more like a true highway capable maxi scoot. Load carrying and touring at national speed limits is easy. The comfortable seating position and easy to read digital/analogue dash make devouring big kilometres a breeze. And with a 12L fuel tank and an integrated trip meter, you know exactly how far you’ll get before empty. The only upgrade I would suggest for these bigger highway runs is to step up to the optional larger screen for better wind protection. The short screen is fantastic around town- just the right amount of protection, yet easy to see over. But on the highway this shorty screen really wants to be a little higher for more comfort. 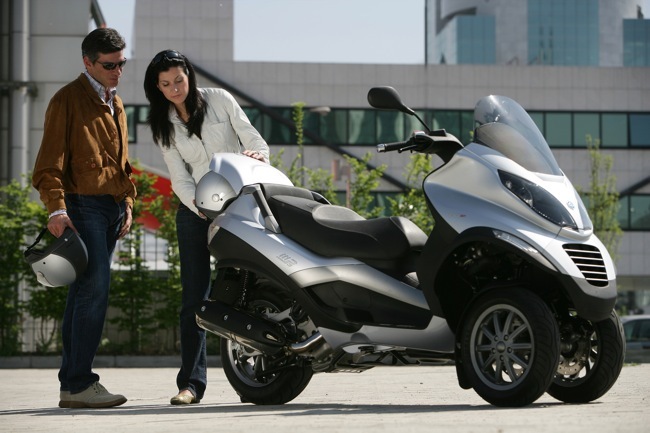 The little-big Piaggio incorporates some great user friendly technologies too. 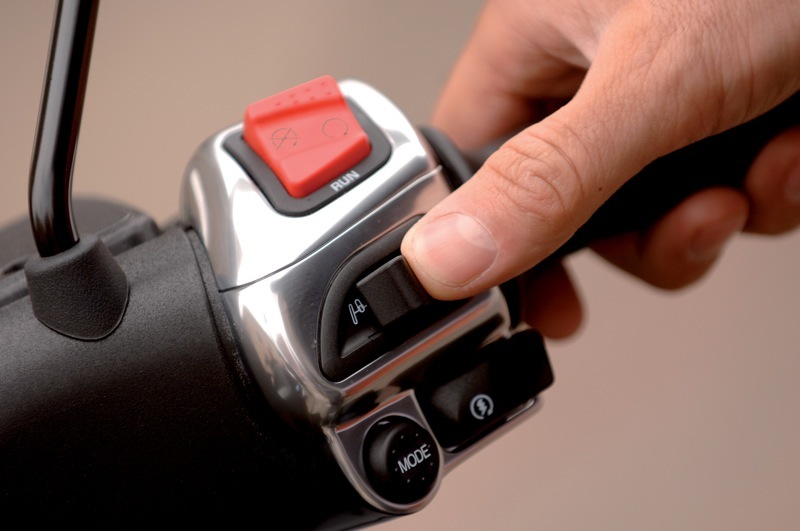 The boot can be opened with a press of the button on the remote key, and the digital display on the dash offers temperature, trip and odometer readings, as well as the ‘distance to empty’ feature mentioned earlier. And the fuel flap is opened with a quick twist of the key in the ignition. Gone are the days of fumbling with your keys in different locks whilst trying to manage your shopping- and if it doesn’t all fit in the cavernous underseat storage, there is the added convenience of a bag hook and helmet hooks. So if I am here, raving about the MP3, then why aren’t we seeing these things roll off dealers’ floors? I reckon this might just be the perfect scooter for me, and the perfect scooter for many other Australian’s- if they just gave it a go. Maybe many people see the styling of the MP3 as a little ‘conservative’ or ‘safe’, unlike the in-your-face Fuoco, and the colour choices across the range are certainly not what you would call vibrant or exciting. And maybe pricing is a factor as people grapple with the money v's value concept and just don’t understand what the MP3 will bring. To me, value is a bigger consideration than price alone, and the MP3 offers possibly the best value in the market today. The MP3 400 can’t be compared to other scooters as it is the benchmark- bringing with it a level of sure footed convenience that you just can’t relate to anything else on the road. The MP3 floats my boat and the month we’ve spent together has made me realise this, so much so that I just don’t want to give it back. For me storage, comfort, ride-ability and confidence are everything I want in a scooter and the MP3 has it all. In town, out of town, wet or dry, the MP3 masters it all. Looks and style for me are not everything (you can’t see it when you sit on it) and whilst the MP3 is no Cinderella, the sum total of the benefits and the practicality outweigh any argument against. The closest thing I have found to the perfect scooter. 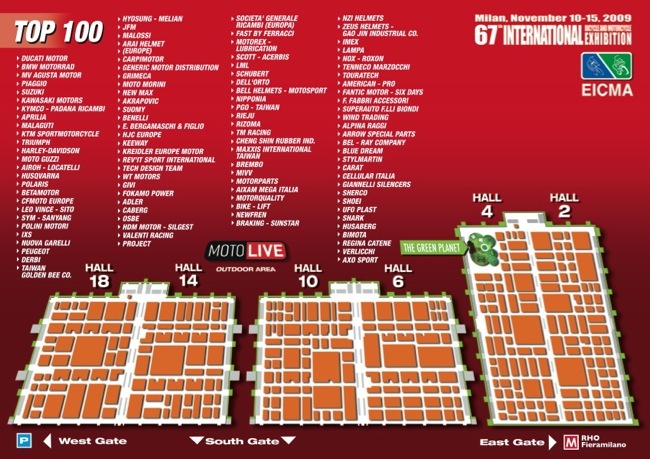 Scootersales.com.au will cover the 2009 Eicma Show direct from Milan, Italy. Its the 67th International Motorcycle Exhibition, the most up to date show for two wheels. From the 10th of November we will have all the latest and greatest happenings in the world of two wheels direct from Italy. With Eicma 09 being the only dedicated two wheeled show on the world stage for 2009 we just had be there to cover all the action. Scootersales.com.au will stream back a host of images and video, including interviews with some of the worlds top scooter manufacturers. Keep an eye on the site or subscribe to our twitter page to be kept up to date on everything scooters. It's another first from Scootersales.com.au.